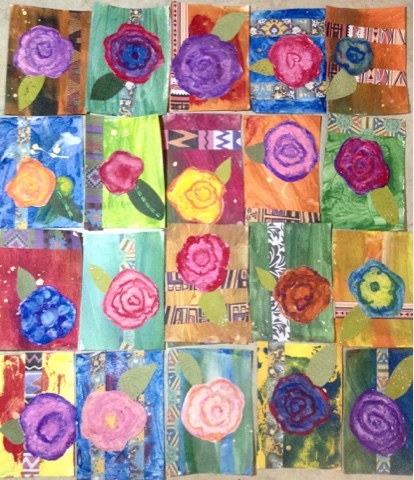 Here is a sneak peek at Tulip Grove Elementary's Artist Trading Cards for Mini Matisse's #ATCswap this year!!! I'm having a hard time parting with these...some are so beautiful I want to frame them! We do them a little different than others participating in the swap. The past couple years I've done them as a collaborative project with different grade levels. This year I had my kindergarten students pain the backgrounds(they were doing a tempera project...so I passed these out as they finished up). My 2nd graders cut out leaves. My 3rd & 4th graders cut out the flowers and did the oil pastel color on them(they both were using oil pastels in their main project for the day..so as they finished they were allowed to make the flowers). I also had 3rd graders match up pattern paper with the painted backgrounds and add the strips onto them.